The first phonograph cylinders were manufactured in 1888. The recorded wax cylinders, later replaced by Blue Amberol cylinders, and vertical-cut Diamond Discs, were manufactured by Edison's National Phonograph Company from 1896, reorganized as Thomas A. Edison, Inc. in 1911. Until 1910 the recordings did not carry the names of the artists. The company began to lag behind its rivals in the 1920s, both technically and in the popularity of its artists, and halted production of recordings in 1929. Thomas A. Edison invented the phonograph, the first device for recording and playing back sound, in 1877. After inventing and patenting the invention, Edison and his laboratory turned their attention to the commercial development of electric lighting, playing no further role in the development of the phonograph for a decade. The earliest phonograph was something of a crude curiosity, although it was one that fascinated much of the public. Early machines were sold to entrepreneurs who made a living out of traveling around the country giving "phonograph concerts" and demonstrating the device for a fee at fairs. "Talking dolls" and "Talking clocks" were manufactured as expensive novelties using the early phonograph. In 1887, Edison turned his attention back to improving the phonograph and the phonograph cylinder. The following year, the Edison company debuted the Perfected Phonograph. Edison introduced wax cylinders approximately 4 1⁄4 inches (11 cm) long and 2 1⁄4 inches (5.7 cm) in external diameter, which became the industry standard. They had a maximum playing time of about 3 minutes at 120 RPM, but around the turn of the century the standard speed was increased to 160 RPM to improve clarity and volume, reducing the maximum to about 2 minutes and 15 seconds. Several experimental wax cylinder recordings of music and speech made in 1888 still exist. The wax entertainment cylinder made its commercial debut in 1889 (a relatively well-preserved and freely-available example from that year is the Fifth Regiment March, played by Issler's Orchestra). At first, the only customers were entrepreneurs who installed nickel-in-the-slot phonographs in amusement arcades, saloons and other public places. At that time, a phonograph cost the equivalent of several months' wages for the average worker and was driven by an electric motor powered by hazardous, high-maintenance wet cell batteries. When relatively affordable spring-motor-driven phonographs designed for home use appeared in the mid-1890s, the industry of producing recorded cylinders for home entertainment use began in earnest. Blank records were an important part of the business early on. Most phonographs had or could be fitted with attachments for the users to make their own recordings. One important early use, in line with the original term for a phonograph as a "talking machine", was in business for recording dictation. Attachments were added to facilitate starting, stopping, and skipping back the recording for dictation and playback by stenographers. The business phonograph eventually evolved into a separate device from the home entertainment phonograph. 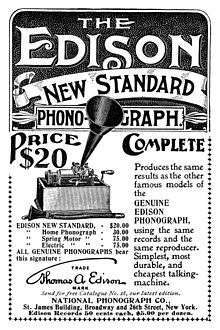 Edison Record's brand of business phonograph was called The Ediphone; see Phonograph cylinder and Dictaphone. Edison also holds the achievement of being one of the first companies to record the first African-American quartet to record: the Unique Quartet. Performed by Ada Jones for Edison Records in 1909. A notable technological triumph of the Edison Laboratories was devising a method to mass-produce pre-recorded phonograph cylinders in molds. This was done by using very slightly tapered cylinders and molding in a material that contracted as it set. To Edison's disappointment the commercial potential of this process was not realized for some years. Most of the regional Edison distributors were able to fill the small early market for recordings by mechanical duplication of a few dozen cylinders at a time. Molded cylinders did not become a significant force in the marketplace until the end of the 1890s, which was when molding was slow and was used only to create pantograph masters. Before using metal cylinders though Edison used paraffin paper. Mass-producing cylinders at the Edison recording studio in New Jersey largely ended the local Edison retailers early practice of producing recordings in small numbers for regional markets, and helped concentrate the USA recording industry in the New York City - New Jersey area, already the headquarters of the nation's Tin Pan Alley printed music industry. In 1902, Edison's National Phonograph Company introduced Edison Gold Moulded Records, cylinder records of improved hard black wax, capable of being played hundreds of times before wearing out. These new records were under the working title of "Edison Hi-Speed Extra Loud Moulded Records", running at the speed of 160 RPM instead of the usual (ca. 1898–1902) speed of 144 RPM or (ca. 1889–1897) 120 RPM. Until ca. 1898, Edison's speed was 125 RPM. In 1908, Edison introduced a new line of cylinders (called Amberol) playing 4 rather than 2 minutes of music on the same sized record, achieved by shrinking the grooves and spacing them twice as close together. New machines were sold to play these records, as were attachments for modifying existing Edison phonographs. In November 1912, the new Blue Amberol Records, made out of a type of plastic similar to celluloid invented by Edison labs, were introduced for public sale. The first release was number 1501, a performance of the Rossini's overture to his opera Semiramide, performed by the American Standard Orchestra. The Blue Amberol records were much more durable than wax cylinders. The Edison lab claimed a 3000+ playback quota for the Blue Amberol. In that same year, the Edison Disc Record came out. In 1910, artists' names began to be added to the records; previously, Edison's policy was to promote his cylinders (and up until 1915, discs) based on the recognition of composers and the works recorded theron in lieu of the performers themselves. Thomas A. Edison, Inc., successor to the National Phonograph Company, continued selling cylinders until they went out of the recording business in 1929. However, from January 1915 onwards the first of the that were Blue Amberols dubbed from Edison's Diamond Disc matrixes, appeared on the market. By 1919, the last decade of production, these were simply dubs of their commercial disc records intended for customers who still used cylinder phonographs purchased years before. Cylinders that are mentioned from 1888 are sometimes called "yellow paraffin" cylinders, but these cylinders are not paraffin, which is a soft oily wax and does not hold up under many plays. They could be a number of formulas tested by Jonas Aylsworth, Thomas Edison's chemist. Most of the surviving 1888 recordings would be formulated from a combination of ceresin wax, carnauba wax, stearic acid, and beeswax. A record of this kind has a cigar-like smell, and is physically very soft when first molded. In a year's time, the record would harden quite considerably. To play these first cylinders, the model B reproducer must be used. The other later reproducers (such as C) were only designed for the harder black "wax" records. A later reproducer would shave down the grooves very fast, and the sound would be lost forever. In late 1888, metallic soaps were tried. At first a lead stearate was used, but in the summer months, these records started to sweat and decompose. In 1889, Aylsworth developed an aluminum wax, using acetate of alumina and stearic acid with sodium hydroxide added as a saponifying agent. It was found these records were much more durable. Problems arose, however, since there was no tempering agent and hot weather caused these records to decompose. Two problems contributed to this, stearic quality varied from different makers; Aylsworth purchased some from P&G and found it had too much olaic acid in it. The next cause of the problem is that all stearic acid without a tempering agent takes on moisture, and after many experiments it was found that Ceresine was ideal. To make the wax hard, sodium carbonate was added. Even so, a few batches of records still had some problems and became fogged. The fog problem arose from acetic acid left in the wax; this problem was solved when higher temperatures were used to make sure all the acetic acid was boiled out of the wax. As such, the records from 1889 to 1894 are a reddish-brown color due to the long cooking time. By 1896, Edison started using hydrated alumina in place of acetate of alumina. The use of hydrated alumina (sheet aluminum dissolved in a mixture of sodium carbonate, sodium hydroxide, and distilled water) made better records, and the wax could be manufactured in a shorter period of time. Using the hydrated aluminum resulted in more desirable blanks, with fewer defects and shorter production time. In 1901 The Gold Molded (originally spelled Moulded) process was perfected for commercial use by Thomas Edison and Jonas Aylsworth (Edison's Chemist) with input from Walter Miller, the Recording Manager of Edison Records. This discussion was gleaned from facts provided by Walter Miller, Jonas Aylsworth, Thomas Edison, Adolphe Melzer, and Charles Wurth. At first, no method of mass production was available for cylinder records. Copies were made by having the artist play over and over or by hooking two machines together with rubber tubing (one with a master cylinder and the other a blank) or copying the sound mechanically. By the late 1890s, an improved mechanical duplicator, the pantograph, was developed which used mechanical linkage. One mandrel had a playback stylus and the other a recording one, while weights and springs were used to adjust the tension between the styli to control recording volume and tracking. The Gold Molded process involved taking a wax master and putting it in a vacuum chamber. The master record was put on a spinning mandrel, the pump sucked all the air out of a glass bell jar, and 2 pieces of gold leaf were hooked to an induction coil. The current was turned on, a magnet was spun around the outside to turn the mandrel, and the gold vaporized a very thin coating on the master. This master was put on a motor in a plating tank and copper was used to back the gold up. The master record was melted, then taken out of the mold to reveal a negative of the grooves in the metal. The master cylinder had to have wider feed as the grooves shrink in length through each process. The master mold is used to create "mothers" and these are then further processed to make working molds. The Gold molded record used an aluminum-based wax, like the post-1896 Edison brown wax. However, carnauba wax was added, as well as pine tar and lampblack resulting in a black, shiny, durable record. The molds with mandrels placed in the center were heated and dipped in a tank of the molten wax. These were removed and trimmed while still hot, and put on a table from where the molds were put in lukewarm water. The water caused the records to shrink in diameter so that they could be removed. The records were then trimmed, dried and cleaned, then later put on warm mandrels for 2 hours where they shrank evenly. Jonas Aylsworth developed this formula. In 1908, Edison introduced Amberol Records which had a playing time of just over 4 minutes. The process of making the finished record was the same as the Gold Molded records, however a harder wax compound was used. In 1912, celluloid was used in place of wax, and the name was changed to Blue Amberol, as the dye was a blue color. The master was recorded and then the process of making the mold was the same as the Gold Molded process. What is different is that a steam jacketed mold with an air bladder in the center was used. Celluloid tubing was put in the mold and the end gate was closed. The rubber bladder expanded the celluloid to the side of the heated mold, and printed the negative record in positive on the celluloid. The bladder was then deflated, and cold air was used to shrink the tubing so the celluloid print could be removed. The printed tubing was put in a plaster filler. When the plaster was hard the cylinders were then baked in an oven, then the ribs made on the inside of the plaster with knives. The records were cleaned and then packaged. 1. 1,200 lbs of double pressed stearic acid (130 degree F. Titer) and 4 lbs of nigrosine base B dye are placed in a 200-gallon cast iron cauldron. The cauldron is directly heated by an oil burner of the household type. (Our Present ones are Eisler, the manufacture of which has been discontinued.) Heat is applied until the stearic acid has been melted and the temperature has reach 360 degrees F. 2. 2,000 grams of metallic aluminum are placed in a 75-gallon steam-jacketed open kettle. To this are added 7,000 grams of NaOH and 10 gallons of water. When the reaction has subsided, 92 lbs of anhydrous sodium carbonate are added and finally 50 gallons of water. Note: The aluminum scrap is usually obtained from the Storage Battery Division in the form of punched strips. It is important that the size and thickness of this material be such as to insure a fairly rapid rate of solution. All of this reaction takes place under a hood. An alternative method consists of dissolving 8,900 grams of sodium aluminate in about 10 gallons of water and adding 5,000 grams of NaOH pellets. When complete solution has taken place, 92 lbs of anhydrous sodium carbonate are added and the necessary amount of water to bring the bulk up to 60 gallons. In both cases solution is affected by means of pressure steam in the jacketed portion of the kettle. When the solution is substantially clear it is slowly added, a pail at a time (3 gallons) by means of a 2 quart dipper, to the heated stearic acid as prepared in 1. The oil burner is kept on during this operation in order to keep the temperature of the mixture fairly constant at 360 degrees F. Care must be exercised in adding this "Saponifying" solution so that excess foaming is prevented. After all the solution has been added the resulting "formula wax" is heated to 400 degrees F. and maintained at this temperature for four hours, at which time a sample is removed, a congealing point determined, (see under "tests"), and any addition made of stearic acid or sodium carbonate solution for correction, and the mixture held without additional heat for 10 hours. It is then heated again to bring the temperature up to 400 degrees F and allowed to cool gradually, usually overnight. When the temperature has again been reduced to 350 degrees F the wax is pumped by means of a Kinney pump into 10 gallon pails from which the wax is poured into shallow pans containing approximately 50 lbs of the wax per pan. After the material has cooled to room temperature it is removed from the pans and stacked. 3. Into a 200-gallon cast iron cauldron heated by and oil burner of the household type, (or as required at present by war conditions, heated by bituminous coal) are placed 500 to 900 labs of "formula wax". Note: The amount of "formula wax" to make up a batch various according to the amount of scrap wax which is to be added to the cauldron. Scrap wax represents commercial wax of which "formula wax" is a part. To the amount of "formula wax placed in the cauldron are added 19½% Paraffin (133 degrees-135 degrees F., usual source Standard Oil of New Jersey) and 2% stearine pitch (M. P. 40 Degrees Centigrade). This mixture, consisting of "formula wax", paraffin and stearine pitch, represents commercial wax. Finally, commercial scrap wax of the composition given above in added until the total weight of the mixture is approximately 1,600 lbs. This mixture is usually heated beginning at 12 midnight and carried through until the temperature is 410-415 degrees F. at 8 a.m. Note; This may be regarded as standard procedure, although at the present time (Dec., 1943) this has been modified so that only Sunday nights is this done. On other days of the week except Saturday the kettles are started at 6 A.M. This method was adopted due to man shortages which necessitated starting the molding operation later in the day.) At this time a congealing point is taken and the necessary adjustments made (see under "tests") after which the mixture is transferred to a closed agitating tank by means of a Kinney pump, the latter forced the hot material through a 2" pipe. 4. To the mixture in the agitation tank there is added 3/10 percent Johns-Manville # 503 Filter Aid. The temperature is maintained at 375 degrees F. by means of a ring gas burner, at the bottom of the tank. At this temperature the wax is supplied by a Worthington pump at 30 lbs to a one square foot Shriver press whose head and follower are steam jacketed and which has 7 sections. The effluent from this press passes through a second Shriver press which has 2 sections of one square foot each. The mixture from the outlet here finally passes though a 1" pipe which has a 100 × 150 mesh Monel, metal screen held in its cross sections by means of a union, into one of four 75 gallon aluminum kettles. . These kettles are protected by conical hoods to prevent dust particles being carried into the body of the wax. After allowing the wax to remain at 330 degrees F. for three hours it is ready to be poured into the blank moulds. The temperature is maintained by gas burners beneath the kettles and controlled automatically by Partlow Corp. thermostatic controls. 5. By means of a pot with 2 spouts the moulds are filled with molten wax. The pot has a capacity of about five pounds (slightly less than 2 quarts and is specially designed of aluminum and made by Theodore Walter, Newark N.J... The molding table revolves at the rate of 6 blanks per minute, approximately, and the size of the pouring pot spout is only sufficient to permit the hot wax to flow into the molds at a rate slightly faster than the speed of the molds which rotate past a given point around the table. The blanks are extracted at a temperature of 200-205 degrees F. and place on boards which hold 30 blanks. These boards when filled move by gravity down a conveyor. The length of time on the conveyor is about two hours after which time they are sufficiently cool and hard to be put into production boxes holding 63 blanks. The boxes are placed in racks for the following day's production. Into each production box there is placed a semi-finished cylinder, which has been edged and reamed and which conforms to a standard internal diameter at 70 degrees F of 1.826 " at the thin end. The purpose of this is to permit the edging operation to take place on the un-finished blank at any temperature by adjusting the machine to conform to the standard. Thus, in each production box, there is a total of 63 unfinished cylinders. One day's production is held at least 34 hours before further processing. 6. The blanks are first reamed. The reamer consists of a twisted tapered and eight fluted tool. The blanks are forced on the reamer by hand to a stop. The position of the stop is adjusted so that sufficient material will be removed from both ends of the blanks when the blank is edged in the next operation. The reamer revolves at approximately 300 RPM. 7. The edging operation consists in placing a reamed blank on a tapered mandrel and by means of two special cutters working in unison the ends of the blank are formed to conform in couture to a standard template. A second gauge is used to insure proper length (6⅛"). IN each case the edged blank must rest on a tapered mandrel gauge in exactly the same position as the standard blank which is in the production box. The usual procedure is to make the necessary adjustments of the knives of the first blank which is edged so that is conforms to the standard, and then continue the operation on the rest of the blanks in the production box at the identical position of the first blank. Note; since there are 63 blanks for each standard blank it will be observed that every 63rd cylinder is checked mandrel gauge. The accuracy of the method and the facility with which it is done depend on the care and skill of the operator. This is the most critical of all the operations. The edging machine revolves at 2,200 RPM. 8. Following the edging operation is the stamping. This consists in applying a hot printing die to the thick end of the cylinder as it is placed accurately in a vertical position under the die. The heating of the die is done by means of a resistance wire coiled within a hollow torus near the under edge of the circular die. The coiled wire is connected to a source of current and the latter is adjusted by means of a rheostat. The heated died has raised lettering and makes and impression on the end surface of the wax cylinder. The depressed positive lettering on the cylinder is filled with a thick paste of zinc carbonate, the excess of which is brushed or wiped off after drying. 9. The cylinders are next shaved on a ganged shaving machine consisting of a rough shaving knife free from "blinds" and "lines", accurate concentricity and a minimum of taper. These factors depend on the tension of the driving belt, tension upon the rotating mandrel between centers and the position and sharpness of the knives. The speed of the mandrel is around 2,200 RPM. 10. The finished cylinders are placed in boxes which contain 16 pegs and run down a conveyor. At a point on this conveyor the cylinders are held and brushed on the inside to remove wax shavings and dust. 11. Cylinders are inspected, packed and placed in the stock room for a minimum of thirty days before shipping. 12. The reinforcing liners are made as follows: Crinoline cloth of specifications given under "Tests", are cut into a trapezoid (Paper Products Dept.) base length 6¼, altitude 5⅝" top length 5¾". A pack of these are placed in a vise edgewise and thinned glue, one part Le Pages Glue, one part water, brushed onto one slant edge. A liner is then wrapped a tapered mandrel of such size as to fit no too snugly on the molding core. The liner is held on the mandrel by means of two jaws actuated by a foot lever and the lapped edges of the liner glued by means of a gas iron held for an instant along the line of the lap. Performed by Billy Murray for Edison Records in 1914. 1909 Edison Records recording of husband-and-wife team Jack Norworth and Nora Bayes' 1908 hit Shine On, Harvest Moon with Ada Jones and Billy Murray. In October 1912 the Edison Diamond Disc Record was introduced. Edison Laboratories had been experimenting with disc records for some 3 years, as the general public seemed to prefer them to cylinders. The thick Edison Discs recorded the sound vertically in the groove at a rate of 150 grooves-per-inch (GPI) rather than the typical laterally-cut groove of around 100 GPI, which gave 10-inch Edison discs a longer playing time (up to five minutes) than laterals and could only be played to their full advantage on Edison Diamond Disc Phonographs. This combination produced audio fidelity superior to any other home record playing system of the time. However, Edison Discs and phonographs were more expensive than their competitors'. This, together with the incompatibility of the Edison system with other discs and machines, had an adverse effect on Edison's market share. Nonetheless, Edison Discs for a time became the third best selling brand in the United States, behind Victor and Columbia Records. With World War I various materials used in Edison Discs came in short supply, and many discs pressed during the war were made hastily and with inferior materials, notably a reformulated phenolic finishing varnish that was introduced when European chemical supplies were cut off. This resulted in problems with surface noise even on new records, and Edison's market share shrank. Prior to the war Edison Records started a marketing campaign, hiring prominent singers and vaudeville performers to perform alongside and alternating with Edison records of their performances played on top-of-the-line "Laboratory Model" Edison Diamond Disc Phonographs. At various stages during the performances, all lights in the theater would be darkened and the audience challenged to guess if what they were hearing was live or recorded; accounts often said that much of the audience was astonished when the lights went back up to reveal only the Edison Phonograph on stage. According to a book published by the Edison company titled Composers and Artists whose Art is Re-Created by Edison's New Art (ca. 1920), the first such comparison test or "tone test" as Edison copywriters referred to them, took place at Carnegie Hall on April 28, 1916 with Marie Rappold of the Metropolitan Opera providing the live vocal performance. After the war, disc quality improved substantially as better quality ingredients became available again, and in the brief postwar boom Edison regained status in the industry. Sales for Edison discs peaked in 1920, but declined incrementally thereafter. In 1926, an attempt at reviving interest in the Edison Disc was with a 450-GPI long-playing disc, acoustically recorded and still spinning at 80 rpm, with times of 24 minutes per 10-inch disc and 40 for a 12-inch disc, but problems occurred (notably with broken groove walls and overall low volume, often only 40% of that of the regular discs), and the disc failed. In August 1927, discs began to be electrically recorded, making Edison the last major label to adopt electrical recording (over two years after Victor, Columbia, and Brunswick had converted from acoustical recording). Concurrently, Edison tried to freshen its catalogues by recording popular dance bands such as those of B. A. Rolfe and Harry Reser (whose "Six Jumping Jacks" group appeared on Edison as "Earl Oliver's Jazz Babies"), the Goldman Band conducted by founder Edwin Franko Goldman, jazz performers Eva Taylor and Clarence Williams, and radio personalities like Vaughn De Leath and "The Radio Franks" (Frank Bessinger and Frank Wright). Classical performers who became Edison artists in the late 1920s included pianists E. Robert Schmitz and Moriz Rosenthal, violinists Arcadie Birkenholz and Erna Rubinstein, the Roth Quartet, tenors José Mojica and Giovanni Martinelli, and baritone Mario Basiola. Despite these efforts and constant experimentation at the Edison plant and their New York studio (including moving from 79 Fifth Avenue to more modern premises at 261 Fifth Avenue in early 1929), record sales and morale continued to drop - in fact, one Edison executive later asserted that Edison discs had lost money from the beginning - and although Edison Diamond Discs were available from dealers until the company left the record business in late October 1929, the last vertically-cut direct masters were recorded in the early summer of that year. After Edison Records closed down in October 1929, many of the employees were transferred to manufacturing radios. Edison's metal masters, including many unissued experimental recordings, were purchased by Henry Ford, and became part of the collection of the Henry Ford Museum. They were recently deaccessioned by the museum and sent to the Edison Historic Site (National Park Service) in New Jersey. Some of the Edison catalogue is in the public domain and available for download at the Library of Congress website. In the 1990s, the assets of North American Phonograph Company North American were purchased by Shawn Borri, who runs it and still makes brown wax cylinders today. The surviving 10" discs have been transcribed to magnetic tape by American Sound Archives, and a project has begun to reissue them on CD by Document Records. ↑ "Fifth Regiment March played by Issler's Orchestra, 1889, MP3 at archive.org". Internet Archive. Retrieved 17 September 2014. ↑ Experiments of Jonas Aysworth notebook 1887–1889 Rutgers University/Edison Papers Project. ↑ see Edison papers Project National Phonograph Co Vs American Graphophone Co. Columbia Phonograph Company. ↑ See Edison Papers Project National Phonograph Co. VS American Graphophone Co. Columbia Phonograph Co 1904. ↑ Ronald Dethlefson, Edison Blue Amberol Recordings 1912–1914. ↑ "The Thomas A. Edison Papers". Edison.rutgers.edu. Retrieved 17 September 2014. ↑ "Shawn Borri". Members.tripod.com. Retrieved 17 September 2014. ↑ "Arthur Walsh stated to Charles Edison on October 12, 1929 "on or about 1912 the Edison Industries began to manufacture and sell the disc type of record and from that date to this, as far as I can estimate, it has always been a losing business", noting a loss of over $1.3 million over the previous five years.". Mainspringpress.com. Retrieved 2014-09-17. Wikimedia Commons has media related to Edison Records. Cylinder Preservation and Digitization Project at the University of California, Santa Barbara Library with streaming and downloadable versions of over 5000 cylinders.